Now you can streamline your diverse document imaging resources and increase your productivity with the versatile Toshiba E-Studio 35 copier. 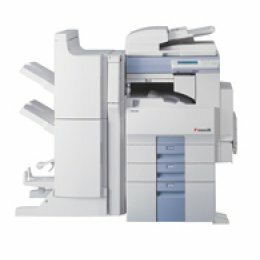 Toshiba's newest digital high performance copier incorporates optional network printing, faxing, and scanning capabilities, in one compact, multifunction device. Modular features and expandable open architecture make the Toshiba E-Studio 35 copier a flexible, cost-effective copier that can be modified with a variety of add-on accessories. Scalable design allows you to create a customized document imaging system that can be upgraded for complete network connectivity to meet your changing business and office productivity needs. The compact and efficient Toshiba E-Studio 35 copier is ideal for medium-sized businesses and workgroups that require a multifunction copier with versatile features in space-limited environments. The Toshiba e-STUDIO 35 copier offers impressive image quality, advanced digital features, and outstanding finishing capabilities in one affordable office solution.